I feel a need to resurrect this-here blog of mine. Really just as a place for me to dump thoughts and ideas and the extra brain-luggage I have. It’s been a while. Lots has happened. Some things are the same. I still know how to stitch and do that once in a while. 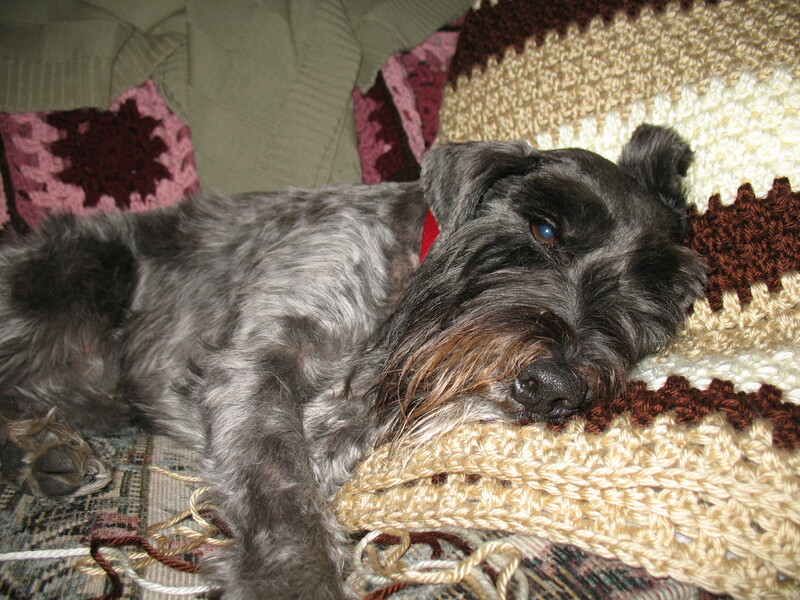 I’ve taken up knitting a bit more than stitching, but both languish a bit due to life. I’m not a caregiver anymore, in the sense that the one person I was caring for moved on to that grand adventure in January 2016, where I know she is renewing relationships with family and friends who have gone before her. And, she’s skipping and running, and hiking and doing. And for that I’m very happy. My little Chloe May joined her last December. 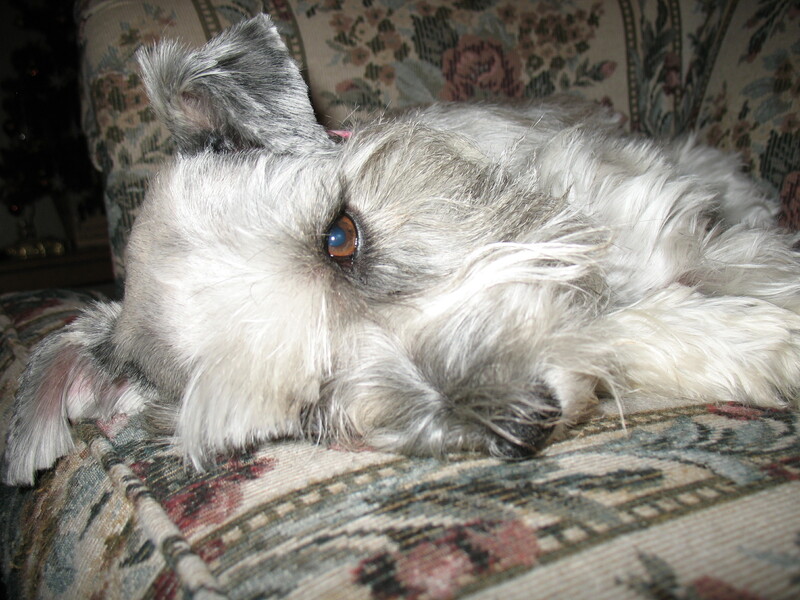 It was clear that Chloe had cancer like her grandma-ma, and she passed in my arms. So, she’s running and skipping by my mom’s side in that grand afterlife. I’m not alone though. I have Buster and Bob Marley. Bob joined my family about a month after mom’s funeral, when he was found wandering the neighborhood. We found each other, and it has been said by many that mom sent him so I’d have another soul to care for. Buster and Bob rule the house and it takes me almost a full Saturday to bathe and clip them both. Buster is a mini-schnauzer mix, while Bob Marley is, I believe, what you’d call a Schweenie (Shi-Tzu and Dachsund mix). His hair never stops growing, and when I found him he had obviously been on the streets for some time, or greatly neglected in the dead of a Utah winter. He had dreadlocks and a matte on his back the size of an R.O.U.S. Thus, when I took him to the vet for some care, and they asked me his name, I told them Bob Marley. Bob recuperated at our house, and wormed his way into our hearts. He goes by Bob, or Bobby now. I’m just recovering from a long, long time of getting by day-to-day. Finding those small moments of life that I can enjoy, and not feel guilty about them. And, dealing with the added responsibilities that are upon me in my professional life. I’m very blessed. Life is good. Truly it is. I’m working to get to where life is “gooder”. I am so excited to join in Nicola’s celebration this year. I have been a bad blogger. And, my stitching has not been as frequent as I’d like because of work and family obligations this past year. 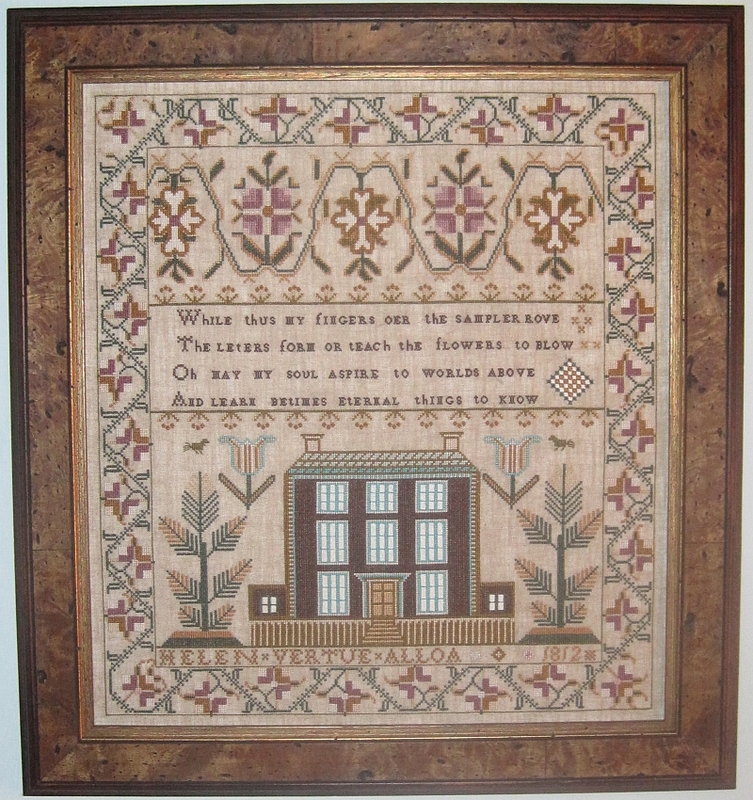 Things have slowed down, and I was already making plans for December’s stitching and 2013 goals, when I saw that Nicola has decided to spur her fellow needleworkers on in a magnificent way. I’m just excited thinking about the progress updates that everyone will post. I may start one of the Twigg Miniatures just because they’re already kitted up! But, I really love Ann Harding. The simplicity of the American Quaker is calling me too. So, I’ll start one of the three very soon. I have a few things I need to finish first. And, of course, this gives me a wonderful reason to pick up a few more charts on my wish list. Here are the top charts on my wish list right now. Of course, they change almost hourly as I drool over my list and the Scarlet Letter website. 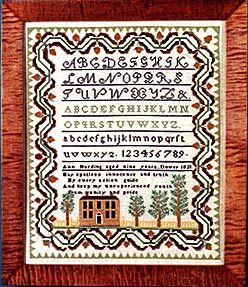 I’m a sucker for alphabets, houses, peacocks… the Margret Lawrance sampler is a newer one from Scarlet Letter. 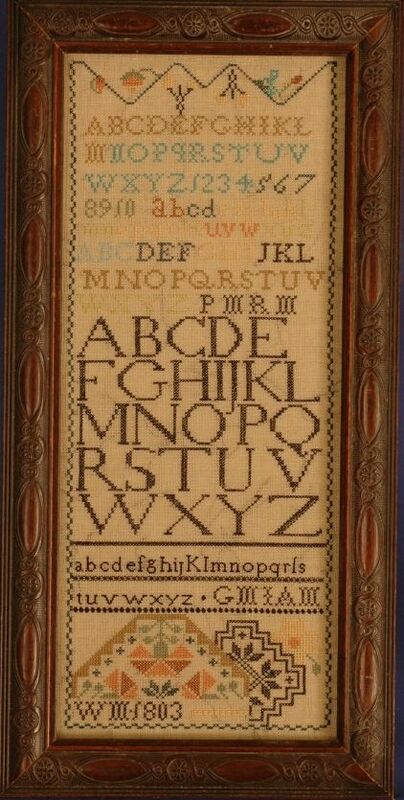 I also would love to work on a variety of samplers from different countries, especially those countries where my family comes from. So, that’s why I have the choices I do at the top of my list right now. I’m off to stitch a bit while I watch Harry Potter! I’m starting to watch the movies again. It’s so fun to see them all so young, and I’ll finish them before the end of the month. I think that will be a great help to my stitching too! I know I owe you folks a few real posts. Stitchy pictures and such. They will come. I’ve had a few in draft mode for a while waiting on pics. Someday my life will slow down enough that I can get back to this blogging thing on a more regular basis. Until then, go Wordle something! p.s., Downton Abbey has taken a lot of free time. Blame Julian Fellowes for my lack of blogs posts! I know I haven’t posted for a while! 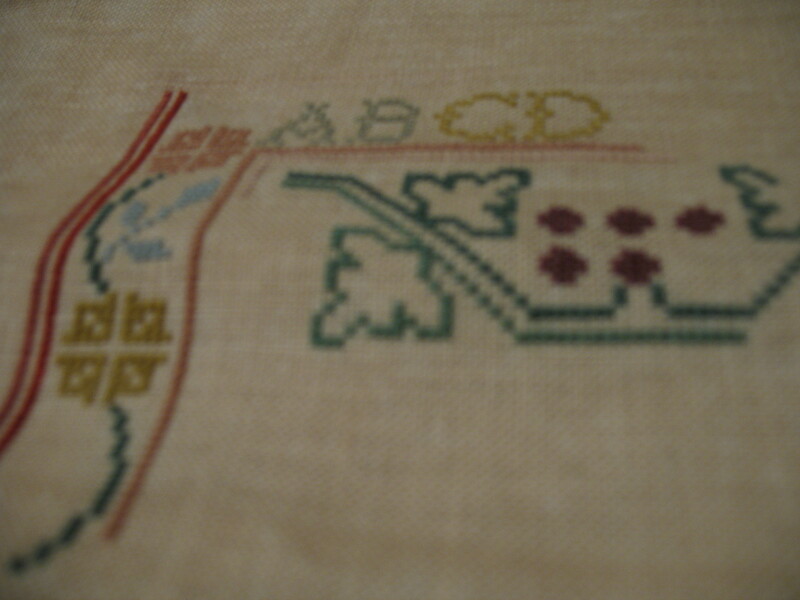 I have been busily stitching and working, and well, that’s just about it. I don’t have pictures right now. I can’t take pictures until late at night, and then the lighting just isn’t good. So, I’ll just say that I’ve finished one of my WIPs, and of course, I have started three more! Yikes. I have made a bit more progress on Moira. Then, I started Paradise Lost. I’m almost done with the middle tree. I promised myself that I would do all of the leaves, branches and fruit on that tree before I moved on to more. I’m nearly there and I can’t wait to do that love snake and the giraffe. I also picked up on LL Black Forest linen in 32 count, which I am using for CHS’ Lila’s House. I’m using the DMC called for and just love it. 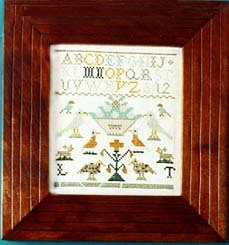 I also have extra of the linen to do one of those new fun folk eggs from the new Prairie Schooler chart. I’m leaning toward the beehive egg. And, I started BBD’s Sarah Lovina Joslin. I’m using the threads called for, which I really love, on LL Bittersweet, 32 count. I know some of you didn’t like the muted pinks, and went for a bit more brightness. I wondered a bit, but now that I have a few down on the linen, I really do love them. 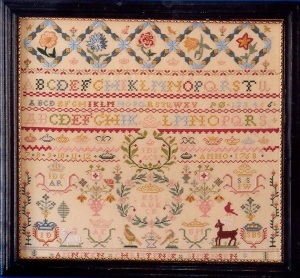 And, I’m a sucker for honeysuckle borders on samplers. That’s all I will say about this one for now, because I think I may give it away as a gift. I will try to take some pics to update all of you this weekend on these pieces. I must say, it’s been wonderful to spend more time with needle and thread. I know the spring garden season will encroach on my stitching time soon, so I think I’m somehow subconsciously feeling that and trying to stitch all I can. It’s a New Year…Bring It On! Hello friends! 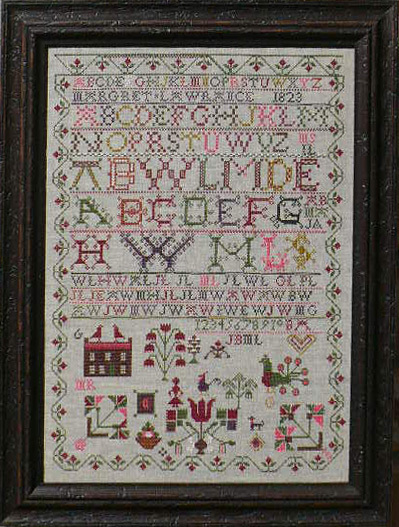 I’m just stopping to show you a little progress on Moira Blackburn’s “Time and Season Sampler”. This is a piece I have had in my stash for quite a while, and knowing it would be for me and a large one at that, I have put it off. But no more. I did cheat a bit and started this last week, so I guess you could say it is my combo Christmas and New Year’s start. It is also the first I am working on in my 15 pieces for the “Up for a Challenge” blog. It’s not a great pic. Lighting isn’t good, but you get the idea. In fact, I think most of these pictures this first little while for this challenge will be a bit off, because I can’t take the pics during the day time. So, my apologies up front! Progress on the office/craft room has been great, although I took a few days off from that project to prepare for this next first week back at work, by getting shopping done and giving Chloe and Buster a “spa day” yesterday. It has been frigidly cold here, but they needed baths and cuts so badly, that my friend and I took care of that yesterday. I couldn’t have done it without her. So, here are Chloe and Buster in their home-haircuts to wish you all a wonderful new year. I woke them to take these… can you tell? Hi everyone! So glad that I have some new friends who have found my blog. 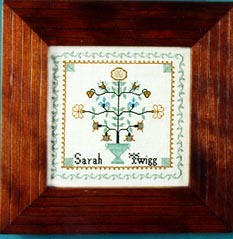 I wanted to quickly post and ask Wendy in Chicago to contact me at stitchinmaniac at msn dot com. You asked me about my BB Designs chart. I do plan to stitch it again, but perhaps we can arrange a loan? I didn’t know how else to reach you, so I hope you’re following my blog. Christmas was a wonderful day, with rest and some good food. I received some great gifts, and think I was able to surprise a few people too. That’s always great. I hope everyone has a great week! I’m on a quick break from the cleaning, painting, sorting and organizing that is my office/craft studio project. Stay warm and enjoy the season everyone! Hello again everyone! I am here to officially wish you a grand and joyous Christmas. I hope that all of you are well and able to spend time with loved ones this holiday season, whether you celebrate Christmas or another holiday. I am enjoying a two-week vacation from the office. That’s not to say I’m not checking e-mail and working on the odd item here and there, but I am at home, doing mainly what I would like to do! I was able to finish my big Christmas shopping today. Woo-wee! I’ve been quite busy for the last few days. I’ve had a couple of house guests (two of my favorite people). My aunt’s father passed away this past week, and she and my cousin were at my home as they prepared for and we attended the funeral. Their stay ended with a big group of family here for dinner on Saturday. It was nice to see all of them, and I was happy I could help provide a place to gather. Now, I’m on to some finishing of projects (minor) for some gifts I’d like to give. We’ll see. I have back-up plans in case things don’t work out. I haven’t decorated my home, other than the small Christmas tree upstairs. At this point, I don’t think I’ll bother! But, I am and have been listening to Christmas music, wrapping gifts, and sending good wishes to everyone. And trying to spend quiet time remembering the reason that I celebrate this wonderful holiday. It’s been wonderful. I have also been stitching a bit! Yay! I’ve been switching back and forth between “Jenny Bean’s Christmas Sampler” and Prairie Schooler’s “Christmas Eve”. And, I’ve picked up some fun items at local thrift shops, to help decorate my little crafting side of my office/sewing room. I’ll show those in a later post. Do any of you have the same problem I have when shopping? Do you find more items that you would like than you do for your family and friends? I have found some really fun items, and I’m happy to report, I am wrapping a few for myself! And, I’m not even wrapping the rest. Hee, hee. By the way, I just ordered from Down Sunshine Lane for the first time last week, and wow, is Amy fast! I was so pleased with her service. And, just the fact that when she has something listed on her site, it’s in stock… Love that. So, tell me what your favorite Christmas carol/hymn/song is… I’d love to know. I live my life to a soundtrack… I really do. I love music. 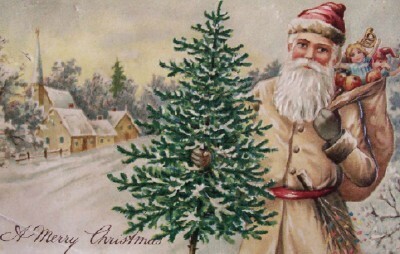 What Christmas song is associated with wonderful memories for you? I’ll share some progress pics of my stitching and my workroom after Christmas. I’m going to spend time this week finishing up the final preparations for the holiday, and spend some quality time with family and friends. I hope you all do too!